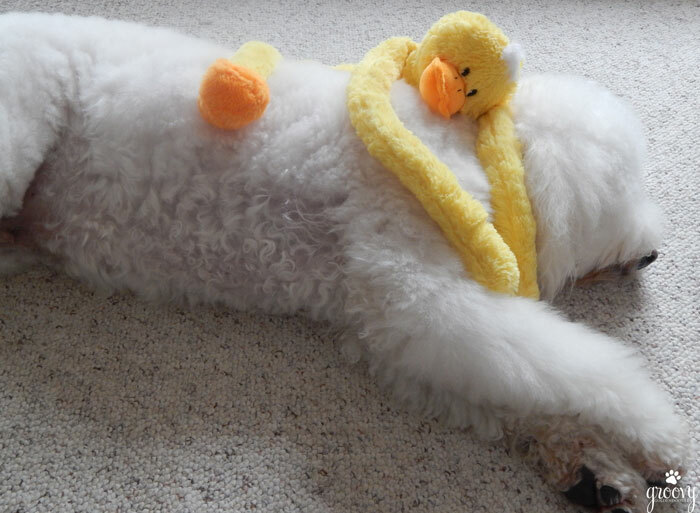 Allow me to share a short and pawdorable story about the duck and the Doodle. A story about a strange relationship that literally came out of nowhere. A few weeks ago the duck arrived in a bag as a gift for the Doodle. While he can be a terror to all things soft and cuddly – the duck must have special powers because he is still in one piece. Since his appearance they’ve been spending countless hours together. 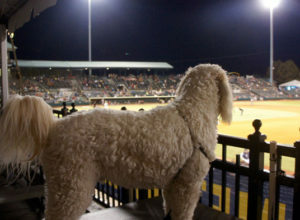 Please stop by on Friday to see an incredible 3D pet print of Harley-Darley! 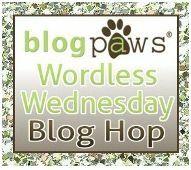 This is our “almost wordless” contribution in the BlogPaws Wordless Wednesday Blog Hop. Get comfy and check out the other Blog Hop posts below! Hello Harley! That’s lovely you have a new (duck) bestie, let’s hope he’s around for a long time! That is a very needy duck, but I’ve seen stranger friendships. You and me both Sharon! Let’s see how long the duck survives living with Harley 🙂 Thanks for stopping by. It’s so funny that you posted this b/c I was going to reply to your post about the frog destruction to tell you that (for some unknown reason) Wrigley used to destroy all his “lovies” in just a few days that same way… Until we started buying him this style with the long arms and legs! He prefers monkeys the most, but also has a lion, a cheetah, and a bear. 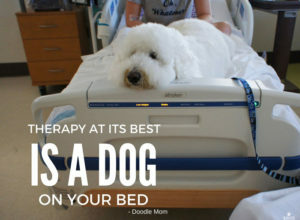 Now he loves and loves on them (which involves lots of nuzzling, licking, cuddling, and occasional “rough housing”) until they literally become threadbare. 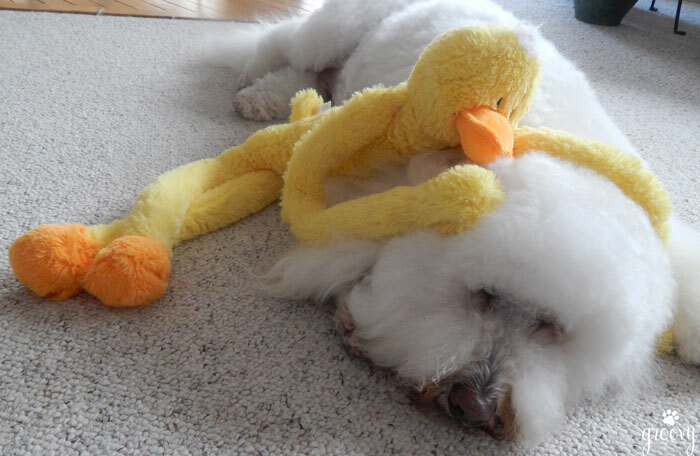 I hope the ducky lasts a long time for Mr. Harley too! Amanda,that is funny. I had no idea he would tote that duck around like that. And I was super shocked that he would allow me to place it on him in so many different positions and just lay there while I did it. I too am curious to see just how long the duck survives. I’ll keep you posted for sure. Wonders never cease. Lol, now I have hope for a type of soft toy that may last longer than 10 minutes with Ziggy,” the King of destruction.” I’m definitely going to pick up a long armed cutie toy today 🙂 I’ll keep you posted. Good luck Claudette – yes, keep me posted. That’s a great analogy Dolly. Love your duck, Harley! You make a cute pair, but be careful he doesn’t take over! Good advice Emma, that duck does have the ability to steal hearts you know. So soft and cuddly. Thanks couz – so far the duck is still a hit at the house. Fingers crossed it stays like that! How fun! Luna has that same duck! Really? How cool is that – does Luna play with it a lot? Such cute and creative photos…..really enjoyed them! 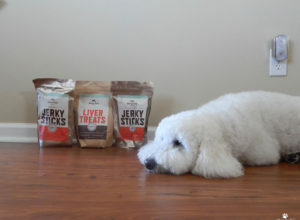 Thanks Debbie for stopping by, so happy you enjoyed the post. Please come back and visit again soon. Thanks Kia, how are you doing these days? 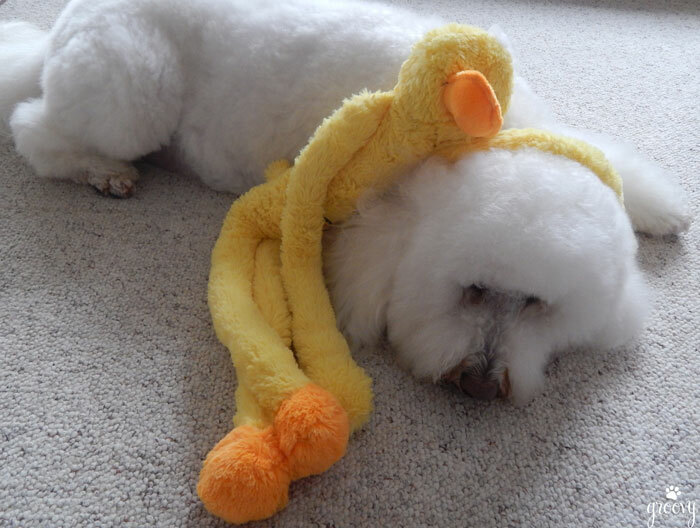 You don’t look like you want to wake up from your nap, even for your ducky friend! Hope you two have fun together! 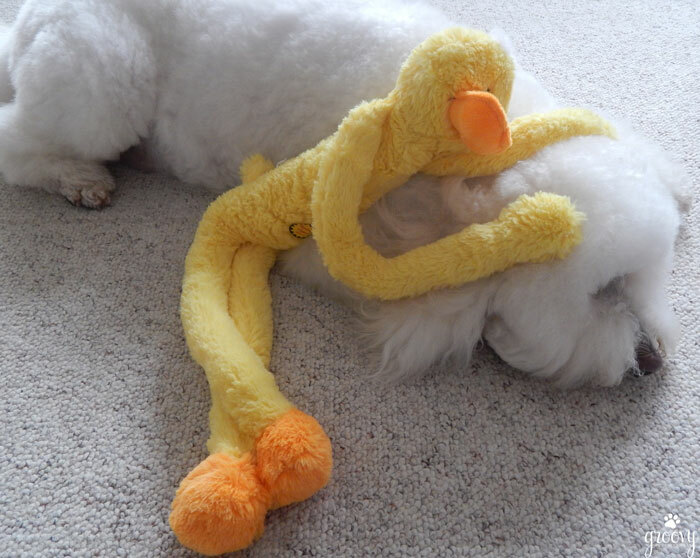 The duck looks like he loves his Doodle. Those are adorable photos and you both look so soft and cuddly. ♥ I can’t wait to see the 3D photo!! Thanks MK – So far the duck is holding his own with whatever special powers he may have. I’m crossing my fingers that he lasts a while longer. Thanks Kelsie! How you doing? Oh, those pics are SO cute! 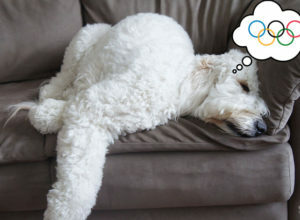 Our Bailey used to have a bunny like that. Good times. Good photo opps too! Bunnies and ducks seem to be the only things that survive for a while in our house Jackie. It might be a strange friendship, but sometimes strange is just what you need 🙂 Gorgeous photos! Yes they are Gilligan, for now at least. Let’s take bets and see how long it lasts. Awhhh, thanks so much Jenna – thanks for stopping by! Love the duck pics, especially the ones during nap time! 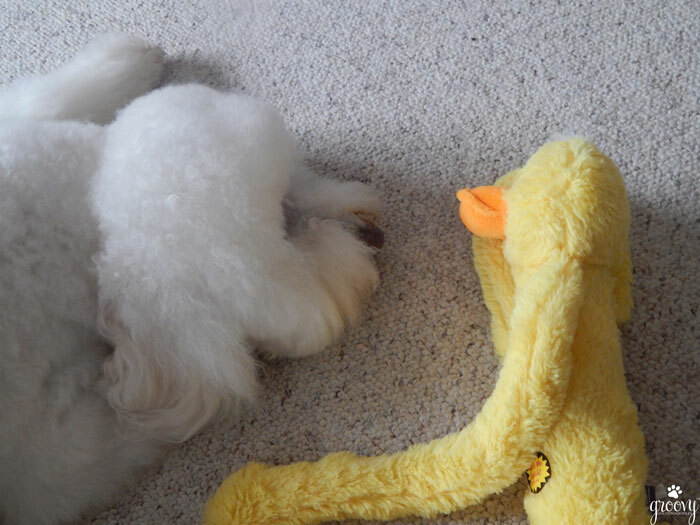 That duck is going to get a huge surprise when you wake up and shake him! They’re adorable together! 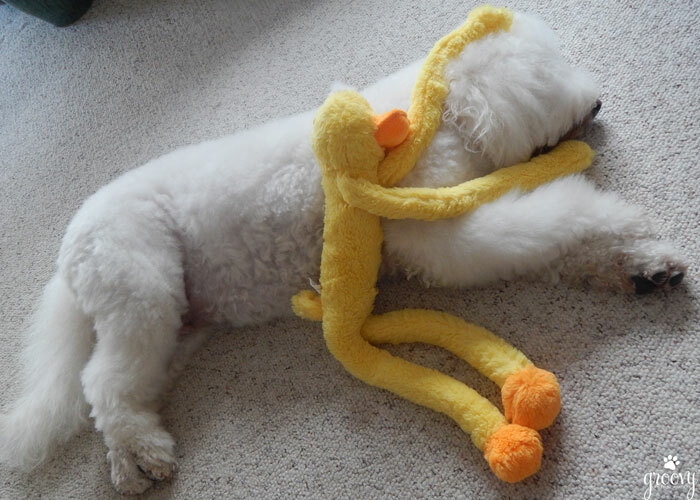 That duck looks like a good cuddle buddy. That was such a perfect story. 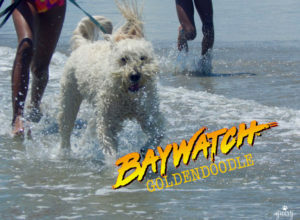 I think it would make a great children’s book with one of your pics of the two special pals on each page.